Cult filmmaker Don Coscarelli, the man behind the iconic murderous silver balls of the Phantasm series, recently wrote a highly-entertaining memoir entitled True Indie: Life and Death in Filmmaking about working as an independent filmmaker since he was a teenager. ComingSoon.net had the chance to chat 1:1 with the genial Coscarelli about the book, as well as the version of Stephen King’s Silver Bullet he almost made, working with Bruce Campbell in-character as Elvis on Bubba Ho-Tep and the potential for sequels to John Dies at the End! Click here to purchase your copy of True Indie: Life and Death in Filmmaking! ComingSoon.net: As a big Stephen King fan I’d known about you having been the original director attached to “Silver Bullet,” so that was the first chapter I hopped to when I got the book. It did not disappoint. The story of Dino De Laurentiis just throwing King’s notes away is insane. Don Coscarelli: It’s totally insane, now you get it. I mean, at the time, my jaw was hanging open because the guy is a freaking national treasure and I think 99 if not 100 percent of any idea or anything that ever came out of Stephen King’s mouth you could bank on, you know? It was just a ridiculous situation. CS: It’s a bummer it didn’t happen because the combo of you and King and Wrightson and Dino was too good. Besides keeping the werewolf sort of hidden, how would your vision have been different than the one that ultimately got made in ’85? Coscarelli: I would’ve been really careful about how the werewolf would be shown. My template when I was conceiving of it at the time was “Jaws,” because they never really showed that shark until the last act. And yet, the desire on Dino and how the story was laid out is that the werewolf was visible in every chapter going forward. I just didn’t think it would work. In fact, one of my scenes is still in “Silver Bullet,” which was the idea that the hunters go down into the ground fog that’s like up to their chest. So it’s almost like “Jaws” with the werewolf running around on all fours, under the ground fog. That was one of my ways of hiding it and keeping it there. I didn’t go into it as much in the book, but one of my great satisfactions was that I’d have these arguments with Dino, and he’s going, “Carlo Rambaldi! We will show the werewolf, all the scenes. It will look glorious. You’ll see it.” Now you see the final movie that they’ve made, and you see one werewolf claw in the opening sequence. So I knew it wouldn’t be possible for it to hold up. CS: It’s fair to say that Rambaldi’s creation in the final film is probably one of the weakest werewolves ever put on the screen. Coscarelli: Yeah, it’s a real challenge. I mean, there are some good ones, but they’ve been really careful. 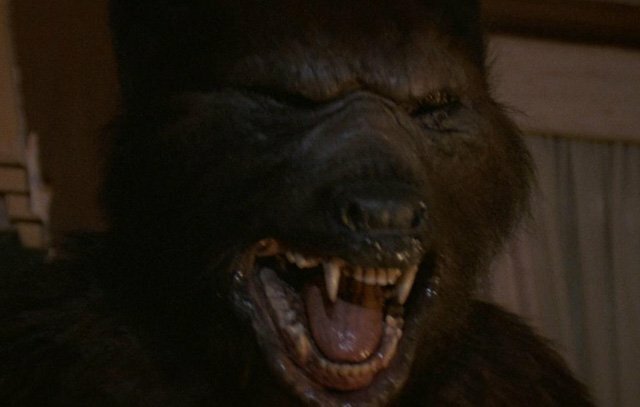 The werewolf wasn’t all over John Landis’ movie or Joe Dante’s movie. They pretty much saved it for spots. 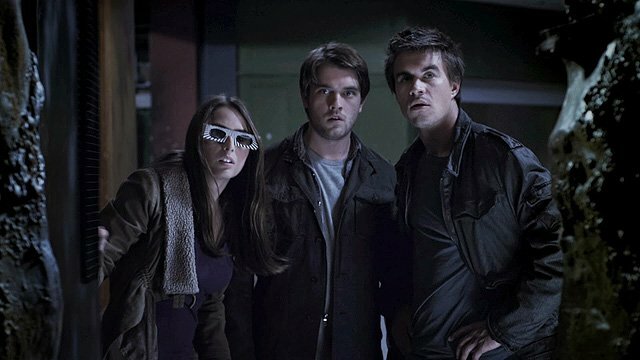 They kept it dark and just had the greatest makeup effects. CS: So is that the biggest one that got away in your career, or is there another one? Coscarelli: That would be probably the biggest. You know, in retrospect, I went through a lot of grief over whether I should’ve passed on doing “Conan 2,” but the script didn’t make any sense for me. The ultimate movie was pretty faithful to that script, and I think that generally “Conan 2” is not considered the best one of those series. CS: It was basically a franchise killer. Coscarelli: Yeah, definitely. I guess it was, wasn’t it? Coscarelli: Well, that’s the other thing, you know? I’m very happy to be typecast as the horror-“Phantasm” guy. I don’t think I would’ve been so satisfied with being a loincloth guy, because that’s more limiting. CS: What’s so wonderful about this book “True Indie” is it shows you can do a lot with very little, if you have ingenuity. Like on “Phantasm 4″ you had a poverty row budget, but you still let your imagination run wild. You utilized deleted scenes from the first “Phantasm,” you nabbed the empty LA street location for no money. Also, unlike a lot of your genre contemporaries, I feel like your movies have only gotten better as you’ve gotten older. Coscarelli: Well, thank you for that. Wow, that’s wonderful to hear from somebody. Gosh. CS: Can you talk a little bit about staying creative and not letting lack-of-money sap your ambition? Coscarelli: Let me tell you a really weird way that I look at my particular peculiar situation. 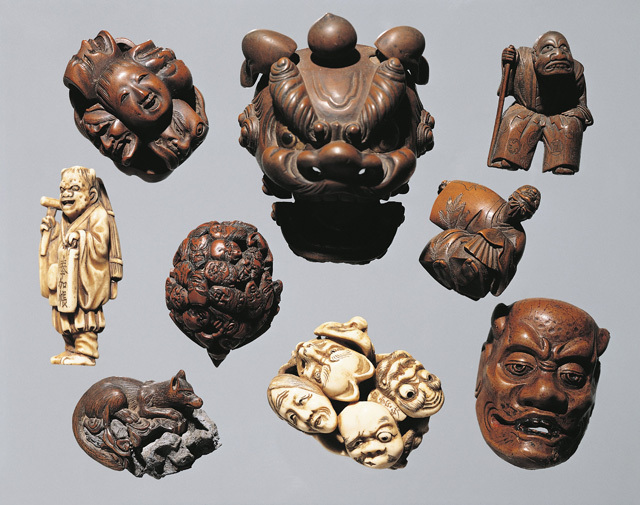 I learned about this Japanese artwork in the 80’s called netsuke. It might sound a little boring, but I’m going to make a point out of it. In the 1800’s Edo Japan period, the emperor said, “No ostentatious show of wealth.” So everyone had to dress very blandly in their kimonos. The one thing that they could spend their money on were these little carved ivory toggles that they would wear on their belts. It became this art form, what these carving artists could create on these little buttons. In Los Angeles there’s a museum section devoted to these things. My point is you have these wonderful Japanese artists, and the the only area they could work in is carving these little buttons. They made wonderful things. Sometimes I extrapolate that to myself, which is that I’m trapped where I only sometimes am able to make these “Phantasm” movies, and other lower budgeted horror genre. So I’m trying to push the envelope, and especially in the later ones, like with “Bubba Ho-Tep” and “John Dies at the End.” Rather than just make a straight-ahead scare movie -which I might be interested in trying again, I’m not closing that door- but I want to make something a little different, and we’ll have them in the genre, maybe be slightly outside of the genre and push the edge. Certainly with “Bubba” that was the case, because that movie was completely sold as a horror movie, but it’s really a drama and a comedy about aging and friendship. “John Dies at the End” was, again, sold as a horror movie, but it’s really an examination of absurdity and maybe some philosophy as a crazy world. I’ve always got my eyes out for thinking about moving in directions that can stay in the genre, because the genre is pretty inclusive. It covers a lot of things like horror, sci-fi and fantasy, things that can be done on a budget. I can still market to horror and financiers can market to people in that thing. So anyway, did you understand my point right there? Coscarelli: That’s why I’m trying to push the envelope a little, but while still being in the genre. Don’t get me wrong, I love horror films. I love genre. When something good comes out, I’m there. I went out and saw “Mandy” the other day. That movie, I loved. CS: “Mandy” is unbelievable. A singular vision and very hard to pin down. Panos waited seven or eight years to get it off the ground. It took him a long time. Coscarelli: Well, that’s interesting. I didn’t know that. I’m hoping to meet him. A really beautiful movie on all levels. Coscarelli: I still haven’t seen it. I’m going to track it down. CS: But I love the chapters in the book about your time as a very young man at Universal on your first film “Jim the World’s Greatest,” working under the thumb of studio head Sid Sheinberg. It’s interesting to see the parallels between you and young Steven Spielberg. 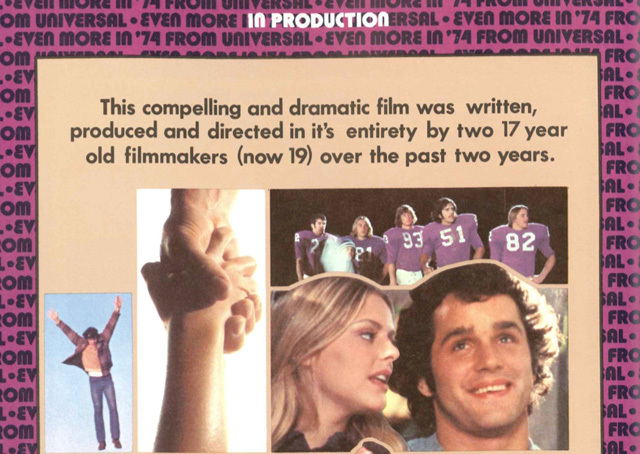 But of course, Spielberg did his time doing “Marcus Welby’s” and “Night Galleries” and TV movies and all that stuff. You chafed at the idea of doing that. In later years, contemporaries of yours like Joe Dante and John Landis have done work in episodic TV as well. “Masters of Horror” notwithstanding, is there something about working in TV that just doesn’t appeal to you? Coscarelli: Well, no. Back then it didn’t appeal to me because it was a different animal completely. Nowadays, television is a magnificent art. Series-based stories, some of the great ones that we all know and love I watch religiously. So that’s where I’m trying to pursue that now. I’d like to try telling a story there and I’ve made a little progress. I’m hoping I’ll pull that all together really soon. But yeah, the 70’s was a period where television was really bad. They used to call it the placebo or narcotic of the masses. There was really a pejorative description of TV. It was a lot of crummy stuff. And Universal was right there. They were making eight hours of primetime shows a week, cop shows and “The Bionic Woman” and stuff. I just didn’t see anything there for me, but hey, it worked out okay for Steven Spielberg! Maybe I should’ve tried it. I don’t know. CS: You could’ve just as easily wound up being just a journeyman TV guy. Coscarelli: Yeah, yeah. That’s true. CS: Something a lot of fans don’t realize is that often directors, even big-name directors, don’t make the majority of their money off their features. They’ll direct commercials. They’ll do script doctoring. I even know of several name filmmakers who direct reality TV under pseudonyms. You’ve had some huge gaps between projects. How have you been able to sustain yourself so you can keep developing all this amazing stuff? Coscarelli: You know, for better or worse, I learned that I needed to study and learn and in some respects thrive in the financial side of things. Early on I worked on the first “Phantasm” with a very brilliant foreign sales agent. I learned about how independent movies can be sold internationally. Then, if one can make a movie that has some longevity to it, you can continue to make money over the years. So from the “Phantasm” films on, I had always focused on trying to maintain ownership of rights so that I could control that. That also gave me creative control, because then I’m not looking for somebody else to fund them. I have a day job, which is making sure that all of those films have current distribution contracts in place around the various international distributors, which is a source of some funding. It makes for an interesting thing. I always enjoyed going to those film markets and actually meeting the distributors. As the years go by certain films are more successful than others. You have to be realistic about what works and what doesn’t. For better or worse I’ve been involved in that sales side of the thing. I always was surprised how few of my director contemporaries got involved with the business side. A lot of them would have their agent submit all their decisions for them. In some cases, made them vast sums of money and basically helped them conquer Hollywood, but I also saw other filmmakers that got bad advice, picked one wrong movie and then never made another film again. It’s tragic, really. So it was just an outgrowth of trying to keep some level of control over my career. CS: All the stuff in the book about what you did with handling the distribution of “Bubba Ho-Tep” is amazing. Right after I read “True Indie” I read Bruce Campbell’s second memoir, “Hail to the Chin.” It was a “Rashomon” experience of getting different perspectives on the making of “Bubba Ho-Tep.” He goes more in-depth on the fiasco of bringing in the Elvis impersonator to train him, but you go more in-depth on the process of the self-distribution. Do you have any other fun stories of working with Bruce that you had to leave out of the book? Coscarelli: I’d like to say that I never really worked with Bruce. I worked with Elvis, because the truth when we shot that movie he’d either be in young Elvis or old Elvis makeup all day long. 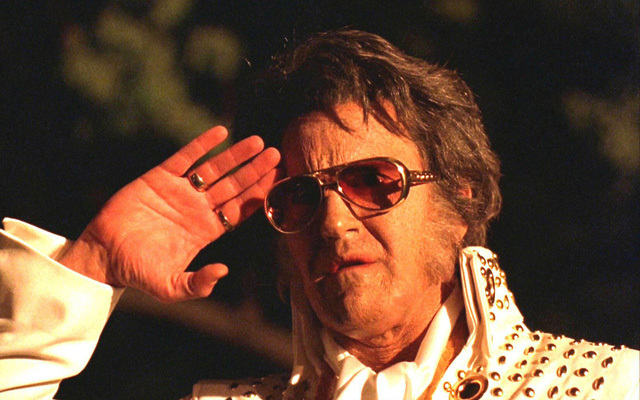 Let me tell you, for the Bruce fans out there, they really missed out on something special because Bruce was in character as that aging Elvis for 14 hours a day. Imagine spending that much time with this crotchety old rock and roll star. It was incredible. There was some banter going on between him and the crew, with him in character as old Elvis that rivals some of the scenes in the final film. I wish I had a full-time videographer following him during the making of it. For any horror filmmaker, especially now that Bruce is such an icon in the genre, to be able to say that you directed scenes with Bruce going mano-a-mano with a prosthetic rubber mummy… let’s face it, that’s the highest you can reach in the genre. Those moments were fantastic, and I look back on them very, very fondly. I’m so happy and proud that he was so great in the movie because his performance is revered worldwide now. I’ll be honest with you: When I cast him, I wasn’t 100 percent sure it was going to work. I’d have some conversations with him, and then he came over to my house and he started to drop into the Elvis character. I got a hint that it could be pretty cool, but to see the final film and the way fans have responded to his performance is nothing short of magic. CS: That was a lightning in a bottle type of film. I don’t know if you could revisit it without it descending into kitsch, but I thought “John Dies at the End” was tailor-made to continue with sequels. There have actually been two book sequels by Mr. Wong, is there any movement on potentially adapting those? 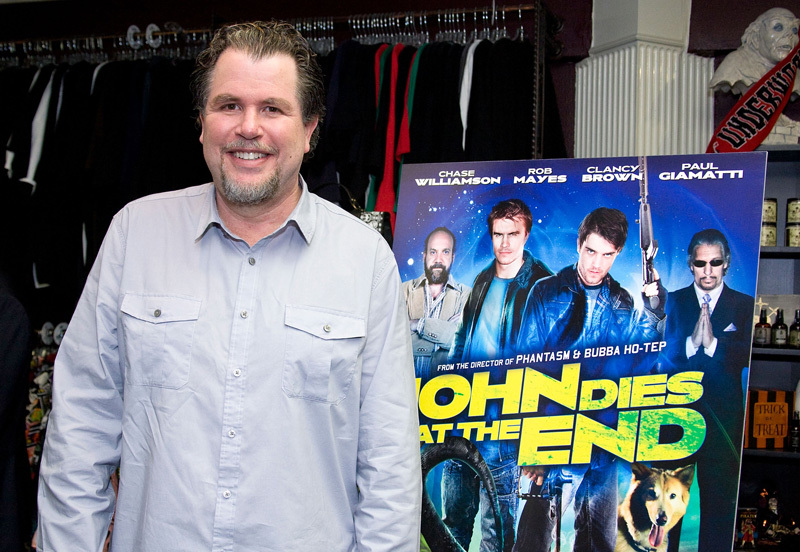 Coscarelli: It’s something that I’m really interested in, and especially with the growing IP in the “John Dies” world, both of the David Wong sequel books. “This Book is Full of Spiders: Seriously, Dude, Don’t Touch It” and “What the Hell Did I Just Read?” are great books with great extensions of the storyline. It’s such a natural and it’s all there, plus I don’t know if it’s been announced but he’s got a contract for two more “John Dies” books. I think the guy is brilliant. So yes, it’s something I’m fascinated with and I’m hoping we can put that together at some point. I had some preliminary discussions, but nothing real serious. I just think that there’s so much more there because those characters and their response to some of these strange events is so amazing. I’m at a loss for words how to describe how much I enjoy it, especially the way that when you pick up one of those Wong sequel books and you read… he’s a unique talent. Some of the deadpan responses to horrific monsters and plot twists he comes up with are just sheer brilliance. RELATED: Don Coscarelli on PHANTASM, Angus Scrimm and…KENNY AND COMPANY! CS: A few years ago when they were looking for a director for “Dr. Strange” I kept telling people, “You know who would just nail this movie? Don Coscarelli would freaking nail ‘Dr. Strange.’” Of course, I knew that that would never happen, but I thought you would’ve been perfect. Coscarelli: That’s so nice of you. That’s really wonderful. Thank you for doing that. CS: It made me wonder if there were any other films that have come out that you sort of wish that you had gotten a shot at. I remember reading an interview with Terry Gilliam where he said, “God, I wish I’d directed ‘Unforgiven.’” Things like that. Coscarelli: Oh I wish I would’ve directed “Unforgiven” too, I just watched it the other day, a great, great movie. Yeah, I aspired to do a Western one day. I tried to do one based on one of Joe Lansdale’s books, but we weren’t able to get traction. It’s a great book he wrote called “Dead in the West”. But yeah, look, I wish my career had evolved. It would’ve been interesting to have the opportunity to be offered movies, especially to be offered a movie where I didn’t have to write the script and didn’t have to raise the funding. Then have a substantial budget with a studio distribution built in. Like I said, I have friends of mine and those kind of things have happened, but it never worked that way for me, but that’s okay. CS: If there’s any one filmmaker I would compare you to -who I don’t think a lot of people would make the parallel- it would be Jim Jarmusch, since he owns the negative to all of his movies. Coscarelli: Does he really? Wow. CS: Yeah, and he has final cut on them, and he takes a certain degree of ownership. Obviously he makes quirky projects and he sometimes has big gaps between films. I think there’s an interesting comparison to be made between the two of you. Coscarelli: Well, thank you. I’m honored. He’s a brilliant filmmaker. I love his movies. CS: In the chapter of the book about not casting Brad Pitt in “Phantasm 2″ you also talk about casting “Survival Quest.” You mentioned that there was another actor you didn’t cast that later became a really big star. I want to take a shot in the dark here, based on the description… was it Ben Stiller? Coscarelli: Well, here’s the thing: Even if you guessed it right, I’m not going to tell you. To have one story about Brad, which I have completely confessed to and admitted to my errors, is embarrassing enough. I will never say, but that’s an interesting choice. Yeah, could be… but I’m not saying!